Recently, I read an article at http://www.bbc.com/news/world-39331314 which discussed the concept of happiness. This article intrigued me because I enjoy traveling and trying to be happy. So, I wanted to read more about a foreign country said to be the ‘happiest in the world’. Also, coincidentally, the Nordic part of Europe has come up lately for me. 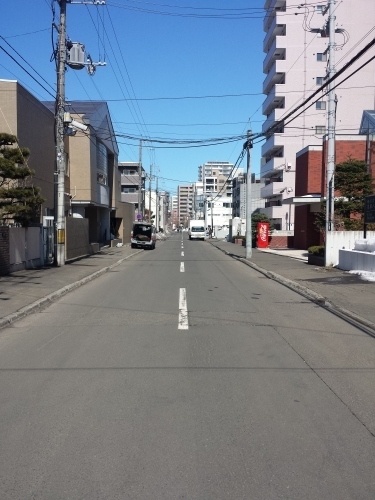 I recently met a friend who is a Social Worker in Sapporo. She had not long returned from visiting a prison in Finland as a part of her research into alternative forms of support for criminals. She spoke very highly of what sounded like an advanced system of rehabilitation. It perked my interest at the ‘alternative’ approach to the way some countries operate as a society. Another recent connection to this part of the world was my recent obsession with vikings! I came across a music band by the name of ‘Wardruna’ which uses traditional instruments to drum, hum and sing Nordic Folk type music. As I listen to it, I can feel my beard grow longer. Anyway, back to the article. Try and read some of it and test yourselves to see if you can get an idea of what it’s about. Personally, I learned about one main idea, ‘Hygge’. Yes, that wasn’t a spelling mistake, but a word translated to mean something like ‘self-care or well-being’. Treating ourselves to something every now and again seems to be a part of what aids general well being. In England, many people rush, worry, binge and purge through life. 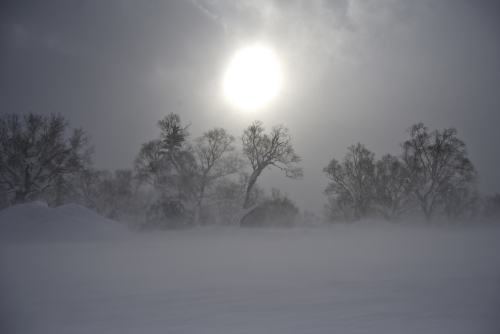 In Denmark, the weather isn’t that great, especially in Winter, with cold days and around 17 hours of darkness! So they seem to make sure they make the most out of small comforts to help them through life. This made me think about the winter we’ve all just had….and still having. So many people I have met over winter have complained about the cold and for some, the winter is just too long. Everyone seems to be counting down the days to the Spring. But I for one had a great winter and would like to share my ‘Hygge’ spirit with you. When the snow started falling, leaving everything with a pure, clean, fresh coat of white, I liked the way it made everything look so different. The outdoors of Sapporo seemed to get quieter and more peaceful as the asphalt was blanketed, making cars drive slower and most other people commute by train or foot almost entirely underground. Snow sports came into season, with mountains of fresh snow waiting to be carved through, like a knife through warm butter. Ramen never tasted better to help warm up the insides and a snowy Christmas spent eating comfort food in the warm while watching movies was my paradise. Outdoor onsens were picture perfect with crisp, snowy views. To top it all off, hunting season was in full swing, with fresh venison offered by a friend making for some amazing home cooked meat. Overall, I enjoyed the Winter and will look forward to the next one. Hokkaido has some of the most distinct seasonal changes I have ever experienced. The Siberian High, which plays a huge role in the Winter of Hokkaido, doesn’t stretch as far as England, so it’s quite unique for me. I try to appreciate each season no more or less than the other, making for an all year feeling of Hokkaido Hygge! I stepped outside the other day and I finally realised that it's mid-March and winter is coming to an end. I imagine many of you are very excited for the arrival of spring, meaning you can cast aside your worries about shovelling so much snow! Although it isn't my favourite season, winter is still one of my favourite parts of the year, espcially here in Sapporo. Walking in heavy snowfall, the amazing feeling when you finally sit down and enjoy some warm food and the frequent events Sapporo is world famous for, all of these things have made this the most enjoyable winter so far in my life. It's strange thinking back and realising the snow started falling all the way back in October and, after a brief period of time with no snowfall at all, December kicked off with record amounts of snow! I've lived in Sapporo before, but waking up and seeing all that snow on the ground still managed to surprise me. As for my highlights this winter? 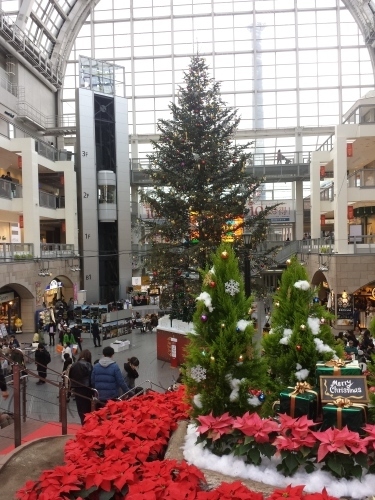 Going to Sapporo Factory with friends to eat and see the Christmas tree and decorations back in December. Although it wasn't too special, it was very nostalgic for me having lived in Sapporo four years ago and it's very pretty once it gets dark outside. For New Year's, an old friend from Sapporo University came from Australia to visit me and we went all the way to the middle of nowhere (Fukagawa!) to eat some ramen made by one of our friends. Probably the most expensive ramen I've eaten to date as the total of the food and travel exceeded 7000 yen! And last but definitely not the least, the Snow Festival! 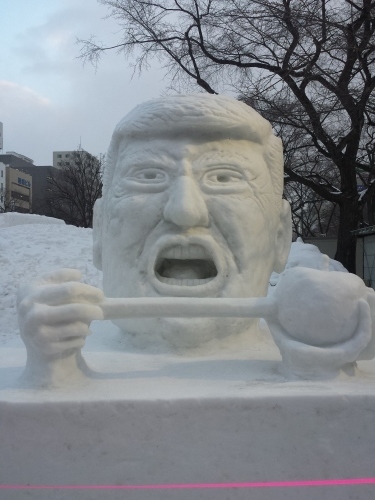 Every day after work I would walk through the festival and just enjoy the atmosphere and I'm sure I'll never forget the Trump/PPAP snow sculpture! I hope you all had a good winter despite all the snow and cold weather and I look forward to seeing you all in the Spring! 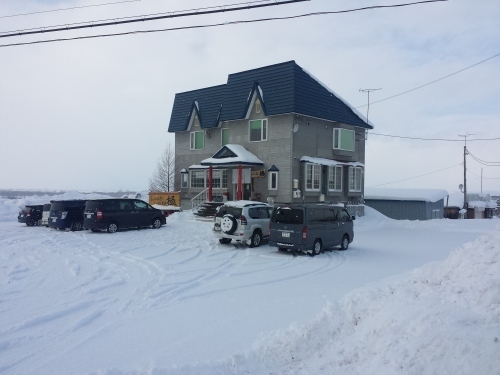 Before coming to Sapporo, I have never lived in a place with so much snow before. In October 2016, when I opened the window and saw tons of snow on the street for the first time, I was filled with joy and literally had to run downstairs to play in the snow around my dormitory. In February 2017, I joined an event to build a snow sculpture for the Yuki Matsuri, and had a really happy day at Odori Park. It was really amazing that they could create such huge and magnificent snow sculptures with intricate details. The festival was absolutely wonderful, and attracted so many foreign visitors to the city. 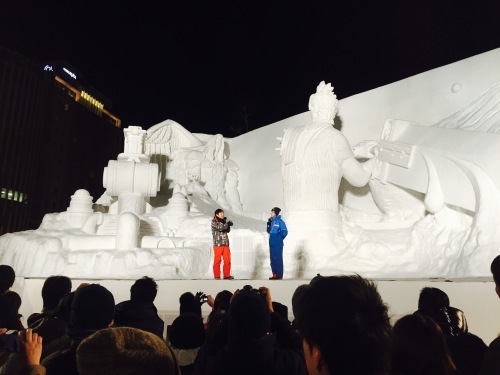 It was also very fortunate that they celebrated the 30 years of Final Fantasy 7 with a big sculpture of the two famous characters of this legendary Japanese game, and I had the opportunity to be in Sapporo to witness it. In March 2017, I went skiing for the first time in a Cross Country Skiing event, and it was one of the most memorable days of my life. I did not expect skiing to be so much fun, and tiring at the same time. It was such an enjoyable workout and I kept smiling no matter how many times I fell. I was utterly joyful when I could finally ski down slopes well after some practice. Cross Country Skiing has become the newest entry on my list of favourite sports. I am very glad to be living in Sapporo, the city with beautiful white snow.